Wide-ranging gains appear throughout the latest sales figures from the United States Mint, supported by last week’s release of Fort McHenry quarter and silver coin products and despite the beginnings of a distracting Labor Day weekend. 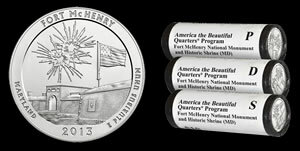 Six products with Fort McHenry quarters debuted on Aug. 26, 2013. Released were rolls and bags of circulating-quality coins produced from Philadelphia, Denver and San Francisco with mint marks of ‘P’, ‘D’ and ‘S’. In unit totals, two-roll sets of P&D Fort McHenry quarters were sought most by collectors with sales of 9,366. Next at 5,329 were three-roll sets filled with P, D and S quarters. Then the S Mint single quarter rolls and quarter bags followed with sales totals of 3,018 and 2,505. Bringing up the rear among Fort McHenry quarter products were P and D bags at 1,916 and 1,869. Also debuting on the sales charts was the fourth 2013-dated America the Beautiful Five Ounce Silver Uncirculated Coin commemorating Fort McHenry. Collectors ordered 10,878 between its Thursday debut and Sunday. It was the fastest sales start in the series since 2011. All six Fort McHenry quarter products and the uncirculated coin were strong sellers for the Mint. This week’s U.S. Mint sales report included updates to 200 products. More than half of them (103) outperformed their prior weekly sales. That compares to 67 previously. Seven products notched unit increases of more than 1,000, which was the same number noted in the prior sales report. As a reminder, the 2013-W Reverse Proof Gold Buffalo goes off sales on Thursday at 5 PM ET. The sales total above is the figure provided by the Mint today. There was a chance that it and other numismatic gold products would have their prices raised today but gold fell early in the morning and that forestalled the increases. Their latest sales are shown below, with minor adjustments likely coming in next week’s sales report. For more about the sellout of the quarters proof set, read this coin news article. Bullion sales levels over the last several days retreated, which is fairly typical with a holiday thrown into the mix. The following grid offers weekly and monthly sales for all U.S. Mint bullion products. The weekly period covers sales from August 29 to September 4, 2013. These tables show the latest sales for U.S. Mint numismatic products. The sales period covered is from August 26 to September 1, 2013. Products with an asterisk (*) are no longer available. The 2013 mintage for the Uncirculated American Eagle Gold Coins is wrong. The figures shown are for the 2013 Uncirculated Silver Eagles. Jack, thanks. Its been corrected above.